Sometimes, a simple tech demo shows so much promise it’s hard to know where to begin. 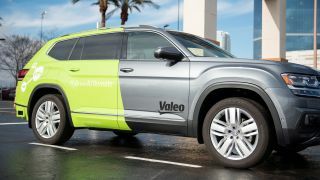 At CES 2019 in Las Vegas, the French firm Valeo held a demo with an operator in one room, seated in front of three monitors and a driving wheel. He controlled a vehicle in a parking lot just outside a window. It was like driving a remote control car… with a real car. Equipped with what a rep called partial autonomous controls, the proof of concept was mostly about how a hotel valet might drive your car to a parking spot or perhaps someone would learn how to drive a car without any real danger, at least to themselves (but possibly to the car). Yet, I couldn’t help but envision a future when this type of remote control driving was not only an occasional diversion for fun – say, driving a Chevy Corvette on a race track at high speeds – but helped a car traffic control center assist self-driving cars, jumping in if the weather causes too many problems for the on board sensors. Sadly, Valeo’s reps didn’t let me drive the car remotely. They mentioned something about liabilities and insurance issues. I get that. Having a journalist driving a $50,000 test car in front of a few monitors probably doesn’t make sense, especially at CES. I first started talking about a car control center about 10 years ago. It would operate in a similar way to an air traffic control center in that human operators would keep track of all autonomous cars, helping with traffic flow patterns. They might decide to adjust the speed of all cars, based on an algorithm that says a certain speed will avoid traffic delays. Of course, mishaps will happen, so these operators could also assume control of cars at will. In the demo, a 2018 VW Atlas moved around in a circle in an area about the size of a small parking garage. The remote driver was able to pull forward, then maneuver into a parking spot. Of course, everything the driver sees is replicated to the remote operator. You can see behind the car, to the side – and the autonomous tech and collision avoidance is still active. Another rep mentioned how the demo wasn’t ready for everyday drivers to attempt. It takes some training and practice to learn the controls, and obviously one wrong move could lead to a serious accident, even on a closed course. My thoughts raced quickly to all of the things you could do to help passengers in the future, and to entertain yourself. For that race track concept, imagine driving at insane speeds on a track with protected barriers – trying to beat the top ‘score’ with a BMW M5 around a track. It’s what you might call the best video game ever. And this is where things get interesting. Could this be a launchpad for even more entertainment – remote controls for monster trucks, boats, trucks, forklifts, and anything else that could become a driverless vehicle with all of the technology we can muster? Of course, the autonomous controls are important. At a stage where physical vehicles drive themselves, remote operation will become essential as a back-up. I liked how the demo showcased the future of driving, when most cars (likely by about 2040 or 2050) won’t have a steering wheel or a gas pedal. It felt like a step forward. Check out all of TechRadar’s CES 2019 coverage. All the breaking tech news and launches, plus hands-on reviews of everything from 8K TVs and foldable displays to new phones, laptops and smart home gadgets.